Compatible with Windows XP, 7, 8.x and 10. Supports older XP machines with USB 1.1 and .Net 2.0 framework. Multi-channel scope with pan and zoom. Digital readouts on command, motor and load position and error. Real time statistical position error analysis. 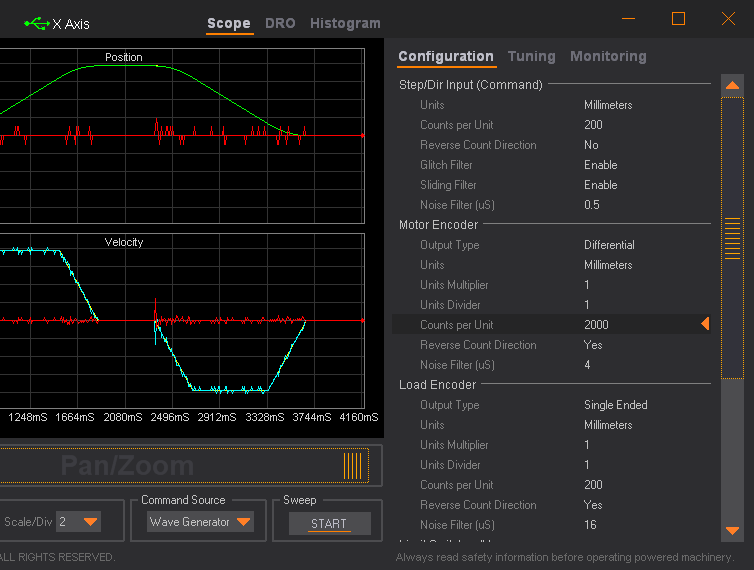 Can be used to optimize tuning or monitor machining operations. Live parameter adjustment while running. Monitor drive health, voltages, temperatures, run-time and faults. In-built waveform generator for enhanced tuning. Metric and Imperial distance and temperature. Supports simultaneous instances for multiple axis connection.